If you are able to successfully reach these ports, the link will return a page that says "ACK." If not successfully, it will return "This webpage is not available." Ports 3443 and 443 are used to activate a software license over the internet. Port 96 is important in order to see software Updates and Feeds within Application Manager. I have tried the three links and received the ACK on screen for each. 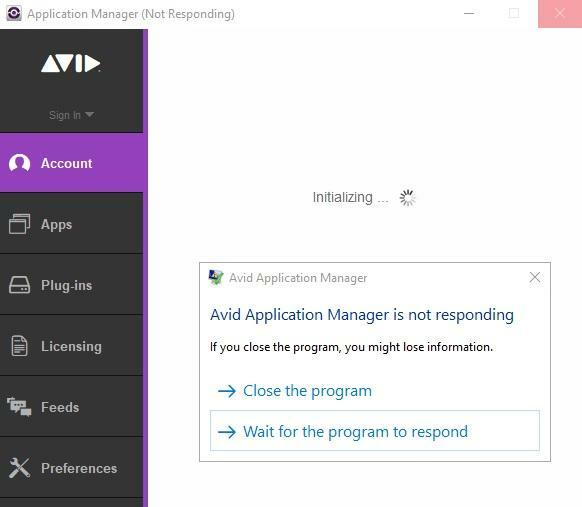 The issue with Application Manager is the same, Continues to initialise and am unable to login with the app eventually failing to connect to the Avid server. Since the last time I posted I have given up trying to fix this as its gone on too long. I encountered this on my laptop yesterday running Windows 7. 1. Select preferences tab then "Clear Cache files"
2. Let it do it sync. Launch AppMan and I was able to sign in. I'm not saying it will work for you but it's worth trying. We're really sorry for the hassle with this. This has not been the normal experience for people and I would love to get this cleared up for you. Within the "Preferences" area of App Manager, could you copy and paste information from the "Activity History" please? Maybe we can get a clue from there. "Re Application Manager won't initialize"
Thank you, however I have removed MCF from the Laptop and maybe attempt again at some later date .. Please let us know when you are able to installed Media Composer | First. and will keep an eye on the related postsi - there is currently about twelve . (Application Manager won't initialize) - maybe it is a Windows issue. Has this been resolved .. ? I had the same issue on a Toshiba i7 Laptop and W10 . I asked support for AppMan 17.7 and they told me unequivocally it doesn't exist. I again got this error with "Initializing...", and after it even more strange error in AppMan window: "Platform Log-In Denied. Application: Media Composer | First out of date. Please update immediately." This time, only clearing Windows Temp Folder helped. I still do not understand why so to complicate this free program destined to attract new users to Avid? date is not definite yet.